Hello friends! 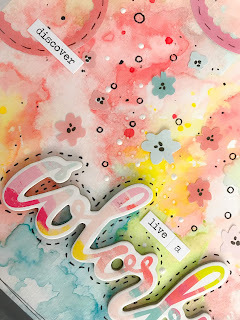 Katty here to share a fun Art Journal Page. 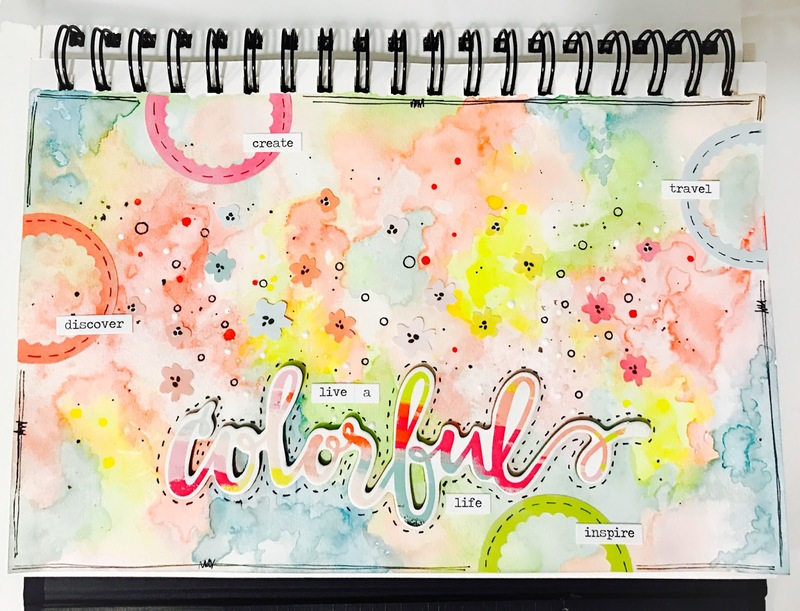 For this page, I just wanted to play with pretty spring colors. I wasn't sure exactly how this would turn out but I love how it did. 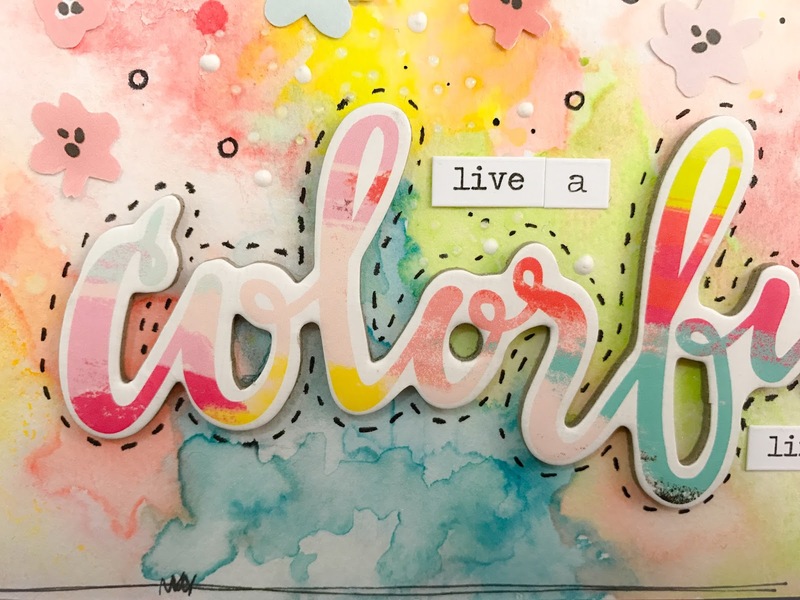 I was inspired by a chipboard word from the Pink Paislee Fancy Free Collection. 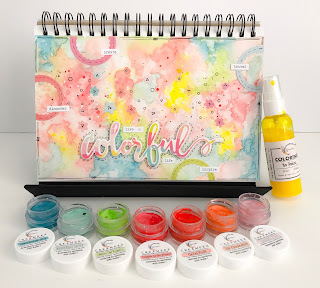 I pulled out colors that would match this collection. I am working in my Daler-Rowney Mixed Media Travelbook. I began with a small experiment which didn't really work out too well. LOL. I used some gloss medium which I had put into a fineline bottle and added some clusters of dots on my page above my chipboard word. My thought was that it would act as a resist when I used the watercolors over it. In the end it didn't shown up too well. Next time I'll have to add bigger dots. 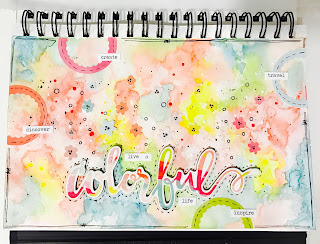 I started layering my colors directly on my page. I used several Creameez and one Coloringz. 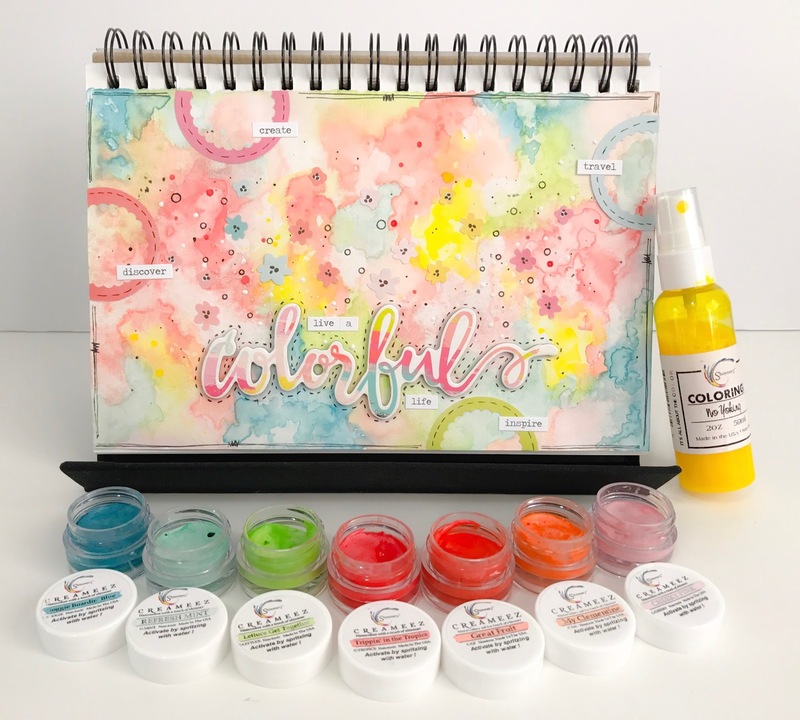 I began with the Coloringz in No Yoking and added color using the packaging technique and spread it out using my paint brush. Then I added my Creameez which have a pretty touch of Shimmer to them. I used Boogie Boardin Blue, Refresh Mint, Lettuce Get Together, Tripping' in the Tropics, Great Fruit, My Clementine, and Cheeky Pink. I made sure to spread the colors out as evenly as I could throughout my spread. I added in some small flowers which I had fussy cut from a Patterned paper from the Fancy Free collection. I used the new Acritonez in 3 Sheets to the wind and added some white dots throughout as well as some black splatters. I added my Colorful chipboard word and some scallop half circles which I had used on a previous project. To add some additional detail, I added faux stitching around the Colorful word and the half circles. I also used a circle stencil and traced some small circles in black pen. I added a few Tim Holts tiny word stickers and I finished it off with a messy double line around the whole page. I love how it turned out.